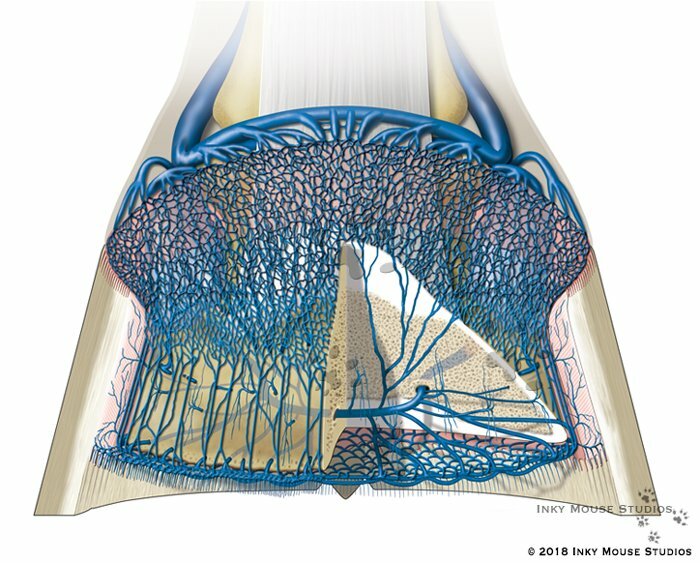 This illustration helps explain the venous hemodynamics within the equine hoof. This is the dorsopalmar view of the venous vasculature of the circumflex junction. It is one of a series of illustrations created for Dr Joanne Kramer who teaches at the University of Missouri. The complete series of illustrations will accompany various venograms and other clinically important images, to help the viewer differentiate the various components of the lamellar circumflex junction. For visual clarity, the arterial and venous systems were broken out into separate illustrations. The other illustrations in this series are the biomechanical pump venous drainage within the equine hoof, the circumflex vessels arterial vasculature dorsopalmar view and the circumflex junction arterial vasculature lateral view. Laminitis is a very complex disease process that takes place within the tight confines of the hoof capsule. Venograms are used clinically to assess the hemodynamics within the hoof capsule. Understanding the vasculature within the equine hoof is critical, especially when managing the laminitic horse. Any disruption in blood flow results in various degrees of damage to the delicate internal structures of the hoof – from mild to catastrophic. Being able to ascertain the extent of the damage helps determine the best course of treatment, and ultimately may even save the horses life. Illustrating the complex anatomy within the hoof is a challenge, showing it from the dorsopalmar view is even more so. There is a lot going on in a very small space, and many different anatomical structures overlap and penetrate each other. Utilizing a combination of ghosting for part of the terminal arch, while removing portions of the distal phalanx (P3), reveals what is going on both within and underneath the distal phalanx. This allows the viewer to understand how the circumflex vessels are formed from the terminal arch deep within P3 extending all the way out to the terminal papillae at the distal margin of P3.